The Coolpad Mega 3 supports triple SIM triple-standby (4G+4G+4G) and features a 8MP primary camera with auto focus and 8 megapixel front facing camera with LED flash for shooting solo and group selfies in any light conditions with equal ease. Under the hood this smartphone powered by 3050 mAh Li-Polymer Battery which keeps everything powered. Coolpad Mega 3 packed with Quad Core 1.25 GHz MT6737 chip-set which lets you multitask with greater speed and enjoy a great gaming experience. With 4G LTE, you can now browse the Internet at great speed. So, streaming videos is now going to be faster and more fun. This device comes with 2GB RAM and 16 GB inbuilt memory which is expandable up to an additional 64 GB using a microSD card. 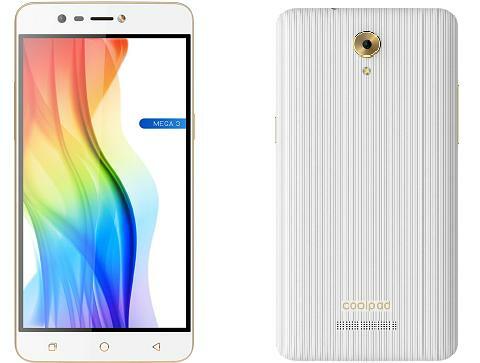 Coolpad Mega 3 features a 5.5 inch HD capacitive touchscreen with 1280 x 720 pixels resolution and 267 ppi pixel density. This smartphone running on the Android v6.0 with CoolUI operating system. The selling price of Coolpad Mega 3 is Rs 6999(It may vary later).